I haven’t been on a walleye water in my life where fish couldn’t be caught on crankbaits or live bait rigs at some point during the season. These two methods have dozens of variations, but the core ingredients can be applied from tiny rivers in Northern Ontario all the way down through the Great Lakes. 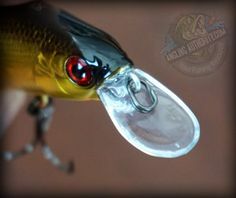 The St. Croix Eyecon Series Bounce-N-Troll (ECC70MHM) is a rod designed for just about any style of bottom bouncing or crankbait fishing that’s out there. I use mine for everything from bumping heavy bottom bouncers and bait rigs over deep structure to trolling deep divers, to casting into knee-deep water in the middle of the night. At 7’0″ in length with a 3-oz lure weight rating, this rod fits so many walleye fishing techniques. It’s comfortable to fish, very light weight and gives you a great mix of feel and power. Right off the bat, the Bounce-N-Troll is up to the task when you need to rig big. This time of season especially, walleye can hang out in fairly deep water and big winds are common. To stay in their zone, you’ll sometimes need to run two, three even four ounces of lead. Even though this model is rated for three ounces, I’ve ran four ounce rigs on it with no trouble. Both bottom bouncers and 3-way rigs keep you in touch with structure and, like jigging, more weight means more feel, more control and less line out. You’ll hang up less and be able to precisely plunk through those little magic zones on the structure you’re fishing. Whichever weighting system you choose for staying on bottom, stay versatile in terms of what you’re presenting. Whether you’re using your outboard, an electric motor or the wind, have people run different set-ups. Anytime you’re moving fairly quickly, snelled spinner rigs make the most sense, with their natural vibration, flash and overall appearance to fish at higher speeds. 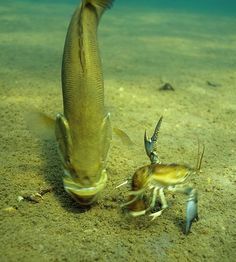 For creeping along, simple hook/bait combos get more time to show their natural moves and leak scent. Appropriately-sized, ‘octupus’ style hooks with fresh bait can be as complex as it needs to be. 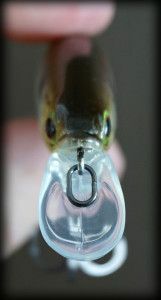 Floating beads or floating jigheads are also great for walleye. As the boat moves forward, baits get drawn downward, towards the bottom. During pauses or decreases in speed, they’re allowed more time to ride up and do their thing. My base set-up with both spinner harnesses and livebait rigging is normally about five feet of Maxima fluorocarbon back to the bait. With 3-way rigs, I typically run about a two foot dropper line, using cheap, light monofilament. If the weight snags, I break it off and save everything else. Experiment with leader/dropper lengths until something clicks. Being able to handle these larger weights in deeper water while still maintaining lots of feel and sensitivity is probably what I like most about the Bounce-N-Troll. You’ve got plenty of power for working that chunk of lead all day, but lots of ‘touch’ when it’s time to feed a little line back to a walleye and drop the hammer on ‘em. The moderate action tip section is perfect. You can’t talk about the Bounce-N-Troll’s bait rigging game without looking at the other half of its personality: fishing crankbaits. This is where the rod really shows its versatility. Crunching structure with steep-diving, slender crankbaits is one of my favorite ways to catch walleye during the day. Once you’ve developed a feel for where you can put them, crankbaits not only catch good numbers of fish, but some of my biggest every season. Small, linecounter reels let you pattern your lures easily. I typically troll between 1.5 and 2.0mph, and split time between walking baits through the rocks and working walleye suspended at different levels in depths from twenty to over sixty feet. 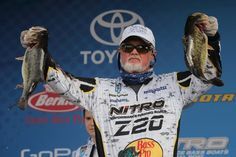 In both cases, the rod blank has to be able to handle the crankbait’s pull, skip it through tough bottoms and keep walleye hooked during the fight. Not an easy set of rules to follow. But the Bounce ‘n Troll does all of the above, and easily. Shimano’s baby 300 Tekota is for dragging crankbaits. It’s got a full line counter, but fishes like a little bass reel. I cast crankbaits with this rod, too. The moderate tip fires them out a good distance. For me, I’d rather comb a shoal using ten long casts than twenty shorter ones. It’s just more efficient. The Bounce-N-Troll loads up beautifully for whipping crankbaits around. In the dark, feeling every rock is important. SC II graphite gives you exceptional feel. With practice, you’ll be able to work divers through some tight, shallow messes. You’ll also know when you pick up weeds, algae, mussel shells or any other debris. Split-grip rods have really gown on me for muskie as well as walleye. Anytime you’re casting and cranking, they lighten the workload, increase feel and fish very comfortably. If you’ve got a walleye spot that turns on at night, try casting up into very shallow water. 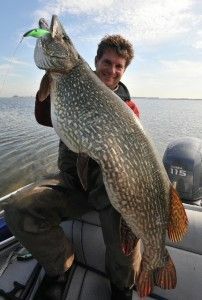 On dark, choppy outings especially, waves of fish can pull way in during late summer and well into fall. 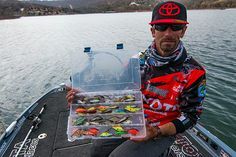 Pick baits that run much deeper than the water you’re fishing, so that you’re constantly rubbing the shoals. Buoyant, large-lipped baits, just like you’d grind the deep structure with during the day, are ideal for casting. Walking them slowly over the bottom and letting them free-swim back to the boat is really effective. Shallower, ‘stickbait’ style baits can be hot some nights, too. Night in and night out, lots of bottom contact over really shallow rocks seems to be the trigger. Having a seven or eight pound walleye hammer your crankbait in five or six feet of water in total darkness is an awesome rush. Don’t be afraid to throw up inside those ‘prop eater’ rocks. Most good crankbaits will bumble and stumble their way out every time. And some really nice fish are available. I could easily spend the rest of my life casting just my old, smashed up blue/chrome Reef Runner Deep Diver in the shallows. To be clear, you’re not really ‘cranking’ these baits hard. Walk them down with just enough pace to dive and maintain vibration. It’s slow and deliberate. Force yourself to feel your bait while keeping your foot off the gas as much as you can. A rod that lets you feed live bait rigs to walleye is one thing, and rod that can handle some of the ‘big digger’ crankbaits is another. Simply put, with the St. Croix Eyecon Bounce-N-Troll you’re getting both. Walleye are a funny fish. Constantly on the move, and prone to big swings in mood. Being able to play different games and adopting a split personality of your own makes all the difference in the world. If you’re into bait rigs, bouncing bottom, trolling crankbaits or casting to shallow fish, this rod’s a dynamite option. Like their other technique-specific Eyecon rods, The Bounce ‘n Troll has been thoughtfully engineered for key walleye fishing methods. Troll it, bounce it, cast it, love it. For more information on St. Croix, visit their website and Facebook page.